There is too long a gap between the last Twin Cam engined coupe (the 124) and this one. Fiat were building coupes when some car manufacturers would struggle to spell the word let alone define a specific market segment for it. And this Coupe is a terrific example. It has everything you would expect of a great Fiat. Long before the production lines ceased in 2000, (sales officially stopped in 2001) the Coupe was confirmed as a true classic. It’s chic, provocatively different, visually stunning, ever so Italian and very true to the fastest of Fiat’s own performance passions. It gave the Fiat brand a much needed flagship again. A car to aspire to own. Today there are enough Coupes around to make buying easier, yet few enough to not dull the senses with familiarity. The normally aspirated Coupes make a well balanced driving package. The turbo’s give you more to play with and occasionally to wrestle. Front wheel drive ensures a regular consumption of tyres, though there are few weak links in the car. Should you wish to improve performance or add body kits, then there are well trodden paths and parts to select. I also think that put next to an Audi TT and Alfa GTV this Coupe not only looks fresh, but thanks to Pininfarina, it has the visual class of the three. You really don’t need me to eulogise any more. If you’ve known and driven a good Fiat before, why haven’t you tried one of these? You owe yourself. Lastly there’s an American guy out there named Chris Bangle who worked at Centro Stile (Fiat’s design centre) as the Coupe project’s concept manager. One day I’d really love to talk to him about what it took to deliver this project. And perhaps he could calm my mounting impatience waiting for the Coupe’s successor (even though he moved on from Fiat some time ago). In the beginning; the Pininfarina badge on the car is because they made the car in their Turin factory, only the interior and wheels were actually designed by Pininfarina itself. 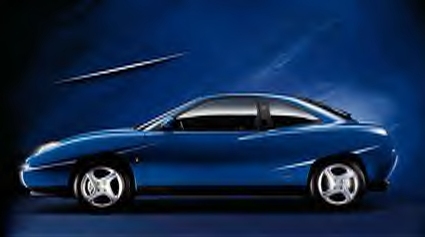 Even though Pininfarina built the car, the concept was designed by Chris Bangle within Centro Stile. 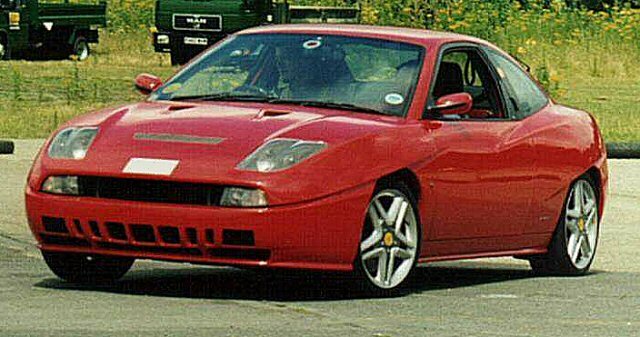 The Coupe was launched late in 1993, but it was 1995 before the right hand drive versions were being imported into the UK. For the UK it was offered with the four cylinder 2 litre engine twin cam, either as a 142bhp normally aspirated 16-valve or a 195bhp Turbo. Both models also had 5 speed manual boxes, and ABS, twin air bags, power steering remote central locking alarm/immobiliser and the usual range of electrics for windows and mirrors. In addition the Turbo had Viscodrive traction control too. The cheapest way to own this sharp looker is via an early, non-turbo, 16-valve model. These are now going for as low as £2000. But although the engine and mechanicals are a well known package (developed from the Lancia Integrale) they suffer expensive damage from things like lack of proper servicing and oil change abuse. The normally-aspirated cars have 15-inch alloy wheels as standard, while the turbo models had 16-inch alloys and traction control. Options included air-conditioning, leather upholstery and an electric sunroof. The five-cylinder, 20-valve models replaced the 16-valve versions in December 1996, and with this power upgrade came a restyled grille, a high-level rear brake light, a better audio system and revised instruments. Happily, the five-cylinder turbo is less thirsty than its predecessor, but the cambelt change is difficult (though not the engine-out job claimed by the dealers if you are careful with the right tools). The 5 cylinder engine gives better cruising with its improved economy. The new 5 cylinder 20 valve engine gave 147bhp from the normally aspirated and 220bhp from the Turbo. Minor changes also included, thinner spoked alloys revised seats, plus larger front brakes for the Turbo and revised paint options. Early in 1998 the non-turbo engine was uprated to 154bhp and further minor changes made to the instrumentation, rear brakes, and bonnet support. 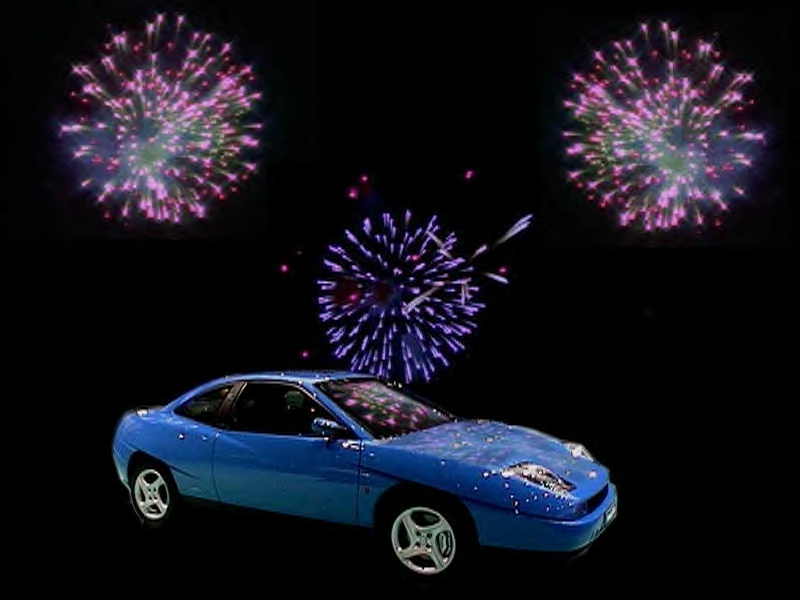 Then in December 1998 a Limited Edition (LE) of the 20 valve turbo was announced. These are sought-after Coupes - having a six speed box, front strut brace, cross-drilled front discs, Recaro seats, air conditioning, a starter button and white fascia dials. The LE also had spoilers and side skirts added and are worth about 15 per cent more than a five-speed car. Finally the end-of-line Turbo Plus models (from August 1999) which have black leather Recaro seats with red stitching, body-coloured side skirts and front spoiler, and a red finish to the front suspension turret brace, brake calipers and camshaft covers. All Coupes from that date had standard air-conditioning, a fully colour-coded exterior, a new grille, revised seats and a luggage net and hooks in the boot. 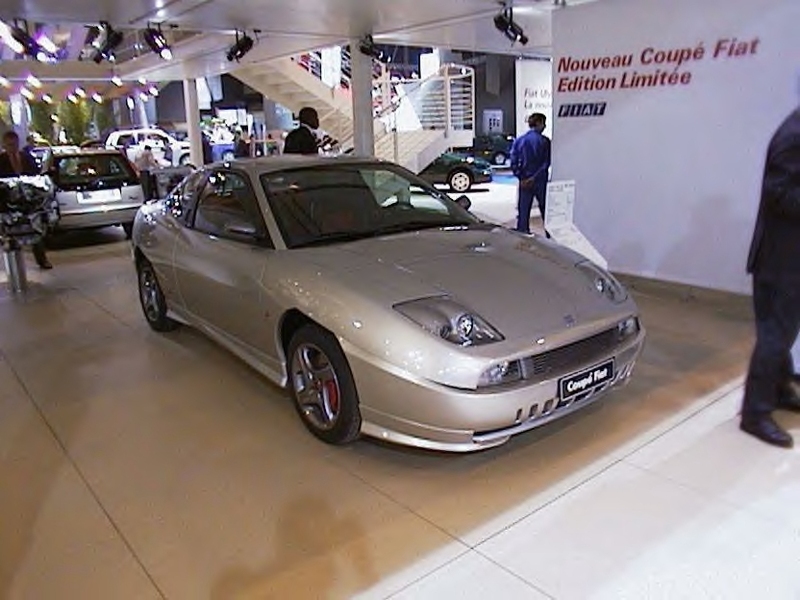 The last Coupe rolled off the Pininfarina production line at the end of June 2000. 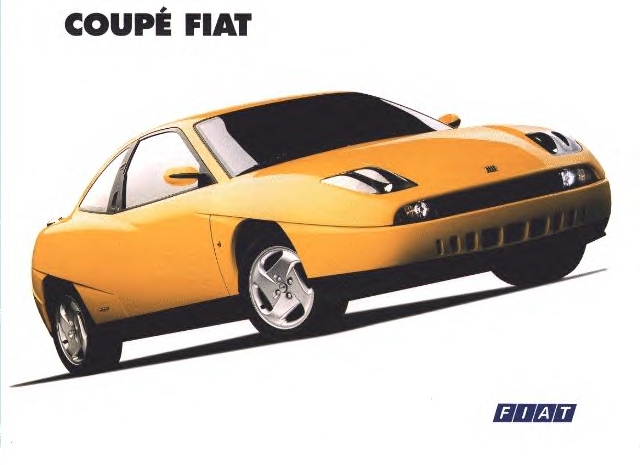 Not uniquely in Fiat history, there is some disagreement between Fiat and Pininfarina about how many Coupes were made. Let’s say no more than 70,000 were ever produced and the 50,000th being completed by July 1997 – this would be nearer Pininfarina’s view. With just under 8000 imported into the UK (dealer and estimated private new/used imports combined) atleast we have a few cars around to be talking about! (October) 20v models in UK. Turbo gains Sprint Blue option. Interiors revised. (March) New version at Geneva Show with LE gadgets as standard. Turbo and Turbo Plus gets LE package. How does it drive? The standard 4 cylinder 2.0 litre 16 valve produces 142bhp and the turbo option 195bhp. The 5 cylinder delivers 156bhp and it’s turbo’d brethren 220bhp. The latter will dash to 60mph in around 6.5 seconds. Members report the standard Pirelli tyres don’t do it too much justice particularly as the edges of the fronts start to wear. This tends to emphasise the car’s light but vague steering feel and feedback especially at town speeds. It has the expected and almost mandatory Fiat taught ride, and easy driving manners. Push hard and it understeers off line predictably. The front tyres wear rapidly particularly if the suspension/ tracking settings are at all out of alignment. Have these checked regularly. Clutch action is light and the steering lock fine, on standard width rubber. Put wider wheels on and like its Tipo ancestors forget the three point turns in favour of five or seven! The 5 cylinder turbo behaves impeccably off boost. So you can choose to potter around town, pick up the wife and groceries, kids with friends and drop them all off as any self-respecting taxy service should – with complete docility and no complaints from the car. Then take to the road on your own for some neck bending torque sessions. Best place to put this one through its paces is the track or de-limited autobahn. The mid range torque curve of the Coupe doesn’t disappoint at around 228lbs/ft max. for the 5 pot turbo. Gear change is positive, in third and fourth gears the car piles on thru’ 130mph. The standard car does 150mph. Some of our modified ones in the club make this seem pedestrian. Very easy to lose your road license in this one! Even on track days I’ve been left wondering how much more there is to come – as you run out of straight and scrabble for traction out of the corners. By the way traction control is installed on the 16valve turbo option, and traction control with ABS is standard on both the 5 cylinder models. When driven on the limit, traction control can’t cure the front wheel drive cornering antics. The 5 cylinders are more economical and a have a smoother engine. For modification the 4 cylinder turbo gains years of development and tuning experience from the Lancia Integrale. Coupes have often been the target of car thieves so check ownership history carefully. The Coupe is a Grand Touring cruiser of the classic coupe variety, with great looks, and is a performance bargain. Thanks again to badge snobbery, you can appreciate quality engineering at great value… you really should try one! Sort the servicing side out – take advice before you buy and these cars show all the potential and manners of the classic Fiat twin cams. Just love them! The Coupe design was based upon the Tipo/ Integrale floorpan. It is then a pretty well understood design. Consequently there have been few weak points in the car’s handling and chassis dynamics. Similarly the four cylinder engine design with its counter rotating balancer shafts is reliable, while its 5 cylinder replacement has been a nineties Fiat revelation in every application. When waiting lists were long many cars were imported from abroad. A quick way (though not totally fool proof as the glass can be swapped) to spot UK cars is to find the UK telephone number for Fiat Security etched on the window glass. Whatever price you paid for these cars, they are still high performance machines. And they need to be maintained as such - with a budget to match. Any garage with a good reputation for looking after Integrales can also look after a Coupe. As we've repeated on several site buying guides - look and listen carefully to the owner. If the owner hasn't appreciated this, can't tell you what the service interval is, and who they prefer to look after the car (with bills), and summarises ownership of the car by being surprised at its pace, cheepness to buy, and the fact its a Fiat - (possibly the first twin cam owned) then worry. The service intervals between the two engines are different. This is worth me repeating several times because we've found more than a few 16-valve owners using 20-valve service intervals at club meets. Some of them were lucky - we got there before too much damage was done. But take note that by mid life you are risking engine rebuilds from failed cambelts, and clogged oil galleries with carbon deposits in the wrong places. Service intervals for the two engines are different - 9000mls for the 16valve and 12000mls for the 20valve. By the time the cars are heading for mid life mileage and beyond this makes a big difference! Check the car’s service record. It is essential that good quality synthetic oil is used and replaced at the service intervals. The 5 cylinder engine having variable valve timing and hydraulic tappets. These are prone to head related sticking problems if abused. A full service history is valuable (but only with supporting bills). Oil consumption can be high – up to a litre per two thousand miles on the 5 cylinder turbo. Recalls by Fiat involved upgrading coolant hoses in the 20-valve turbo, replacing air conditioning hoses and a modification to the air bag warning light. All UK cars should have had these modifications some years ago. The engine bay is crowded, making engine removal a lengthy task. The five cylinder engine has an expensive service scheduled at 72,000mls or 6 years involving cambelt replacement. When engine removal is recommended by Fiat. It is generally better to have all the belts and tensioners changed at the same time. It should be noted that, like other twin cams, it is just possible to change the cambelt without engine removal, providing a reliable way to mark & hold the cam pulleys in position is found and well-tailored obstruction tools are available. Beware back street bodgers however as the 5 pot needs to be canted off its mount to achieve this, and the lazy will avoid disconnecting (and straining) the exhaust. It is essential that the cambelt is changed regularly – especially on hard driven cars. Check the cam cover insides for any sign of belt flecks. Consider changing the Cambelt when you buy anyway. The 16-valve is the heavier on cambelt wear and more prone to jumping a tooth in light impact accidents. Don't wait for the service interval use between 2/3rds and 4/5ths of the interval depending upon how hard it was driven. Gearbox, the box should not be notchy, or have a 'double gate' feeling on selection, the synchros dont crunch at all when the oil is warm. Gearboxes displaying these sorts of traits are rare and to be avoided. The diff and drive shafts are a well tried design, don't clunk unless worn, and shouldn't give huge torque steer when accelerating and then onto over run. The whole package is progressive. Do not expect the traction control to save you on the turbo models - it won't! Check clutch and clutch action - replacement is expensive (engine out costs) so do it all at once if you plan to keep the car. If you don't want to change to a uprated racing clutch (its heavier and often noisier) consider having a hybrid built - with new Fiat pressure plate, and AP friction plate. This is a good compromise for the car. You'll need an AP agent to do it. Check the exhaust brackets and manifolds for cracking - especially on the 16-valve engines. Consider a replacement CAT on purchase. But the 20-valve turbos have also been showing signs of fatigue-like cracking on the exhaust manifold at 60 to 85000 miles. Exhaust tailpipes - the chrome tailpipe looses its spot weld and tends to drop off - check for corrosion at the join with the silencer. Fiat exhaust (from Cat) is about £160 fitted, Supersprint £280, see table below for more options. Turbos have no real differences in the Coupe - check the car from cold, on start up the turbo seals will betray wear signs by sending water vapour out the exhaust as white smoke, after a run the car left on tickover will send blue smoke out.... the problem is to gauge how heavy this is. The Coupe will burn a small amount of oil anyway. If it is hazey with no noticeable oil smell its probably ok. The turbo should come in at about 2.5 - 3 thousand rpm with a big torque jump. Boost is limited under certain conditions by the ecu, in the pre '98 5 pots in 1 & 2, but not by the traction control if wheels are spinning. Check brake discs and calipers – heavy wear point. The Brembo standard issue are hard pressed to keep up with the car's weight. They also need as much cooling as you can duct in if you drive hard. Discs to tend to warp though so check for judder under braking. The inside pad tends to wear faster too.... budget to replace everything if you can. Check front brake pads - inners wear twice as fast as outers. Check Steering - the 20valve turbo shares its rack with the Alfa GTV - 2.2 turns lock to lock, the16VT layout is similar to the Tipo. Clunks could be from drop links, wishbone bushes or the antiroll bar links and need to be tackled. Wishbones - tend to be clunks on hard accelerating and braking - Antiroll bar mounts clunk an floor when under body roll suspension changes - wandering steering when straight on motorway all three. Consider strut braces too. Check the front tyres for even wear across the tread - and the front/rear wheel alignment on the road. This also means careful scrutiny of the suspension lower wishbone arms and bushes is needed. At 6 years old and over consider a complete re-bushing of the car's suspension. Hand brake linkage provides a good check re: diligent servicing. They will cause little trouble if regularly greased and checked. Clean and greased with free action at both ends is what's expected. The main body panels are large thin and expensive to replace. Examine the bonnet for stone chips and dents (both sides). And the engine undertray for signs of abuse. But the non-metallic paints used are soft and prone to damage from stones etc. Check the cars flanks for damage, again the B post to tail light is one panel costing around £740. The door skin is also expensive, smooth and prone to denting. Check for repairs. Look at how any bonnet scoops are installed – the supporting frame shouldn’t be removed or cut (if it was then what steps were taken to re-stiffen the bonnet?). Early (pre1998) cars had a complicated bonnet strut needing release before closing – leading to breakages so check it. Boot lid can be distorted by repeated closing/being push down from one side, and the internal lock release can stick closed. Minor points to sort really. Check operation of built in rear window aerial - they tend to lose efficiency. Relays tend to stick in mid life onwards cars - don't assume everything is working and check operation. Make sure you have the Red Code Key and key fob for the car. If you loose them both then door and ignition locks, and the ECU have to be replaced. Expensive. Door Mirrors are electrically adjustable & heated when the rear screen de-mister is switched on. Check this works, the mirrors are complex and new ones expensive. Alarm - Immobiliser - Check the alarm and central locking is working, an aftermarket Category 1 alarm is around £250 and upwards. Headlamps - are toughened plastic with a thin protective layer which yellows with age. Polish it and it can start to peel. Then they are more prone to scratch and chip damage. The plastic covers can not be simply replaced, and the replacement unit retails for £250 each. Accident damaged cars tend to jump cam belt teeth in quite light accidents - particularly the 4 pot. Beware of slight, regular missing at tickover and low revs when accompanied by a tiny similarly timed ‘clacking’ from the cam box. On the other hand a slightly irregular tickover alone is quite common. Seriously bent valves do not necessarily show catastrophic symptoms at first. It’s also not so difficult to over-rev the engine. Compression test for cylinder and valve leakage. Lumpy tickover can start with a dirty (sticking) idle control valve, partially blocked injectors, malfunctioning sensors, up into the head problems above. Take someone along who can tell the difference! Check for entry/ exit tears from the rear seats - can be expensive to solve. Check the Interior for marks stains and scratches as the interiors, especially the leather ones, hold their price. Have a close look at the interior, dash, door and seats. If you are buying get the seats from the LE or Turbo plus they offer more lateral support. The standard Clarion Sound System is fine. Subtle styling? Try the rear spoiler. But for looks only, don’t expect downforce or drag factor improvements. Best tyres? I’ll let you lot argue over the choices – choose well to transform the car’s feel. Best wheels? I’d stay light weight – definitely needs bigger wheels to look its best too. Bigger wheels shouldn’t mean heavier wheels if you want to improve the handling! Anti roll bars uprated? Yes Eibach are good though not straight forward to install (bar passes close to gear linkage at the rear of the engine bay. Lots of components removed for access. Brakes? Try AP, bigger Brembo (again), or High Spec for improved anchoring. New Alfa calipers can fit (with new offset disk rotor and bell) too. Brake Pads? Responds well to several – any suggestions? Body Kits? Amongst others, quality body kits can be found from the links section. 1995 16valve 2 litre engine twin cam, 142bhp. Both models also had 5 speed manual boxes, and ABS, twin air bags, power steering remote central locking alarm/immobiliser and the usual range of electrics for windows and mirrors. In addition the Turbo had Viscodrive traction control too. Options included air-conditioning, leather upholstery and an electric sunroof. 1996 20valve 2 litre, 147bhp. With this upgrade came a restyled grille, a high-level rear brake light, a better audio system and revised instruments. The five-cylinder turbo is less thirsty than its predecessor and the 5 cylinder engine gives better cruising with its improved economy. Minor changes also included, thinner spoked alloys revised seats, plus larger front brakes for the Turbo and revised paint options. Early in 1998 the non-turbo engine was uprated to 154bhp with further minor changes made to the instrumentation, rear brakes, and bonnet support. In December 1998 a Limited Edition (LE) of the 20 valve turbo was announced, having a six speed box, front strut brace, cross-drilled front discs, Recaro seats, air conditioning, a starter button and white fascia dials. The LE also had spoilers and side skirts added and are worth about 15 per cent more than a five-speed car. August 1999 t he end-of-line Turbo Plus models have black leather Recaro seats with red stitching, body-coloured side skirts and front spoiler, and a red finish to the front suspension turret brace, brake calipers and camshaft covers. All Coupes from that date had standard air-conditioning, a fully colour-coded exterior, a new grille, revised seats and a luggage net and hooks in the boot. MotorSport-Developments have attained a considerable reputation for sorting mapping and misfire problems of tuned Coupes and Deltas that other companies struggle with. Based in Blackpool, their advice is well worth the trip. Check the website articles on turbos and actuators for some straight forward explanations too. Zoo Motorsport can really set your steed up for that track day, including their corner weight service. Suspension and handling specialists, they also offer a one off part manufacture service when you're stuck. Motorsport Fiateers should note! ASD Styling provide some good looking kits. The Tuning Shop has a well laid out site to compare them, and Eurospoiler, Hofele, Hormann and Postert options. A German Tuner who has lots of goodies for your Coupe. Hofele Design.mostly VW Audi but some parts are useful on the Coupe. Hörmann Motorsport Kempten (Germany) U.K. Dealer: Racing Brands of Pangbourne Berkshire. Located in Germany Hormann offer body kits, tuning packages and suspension options. Novitec Automobile Hochstraße 8 87778 Stetten (English agent : Forza Tuning, St Leonards Rd, NW10 6ST Tel: 0208 8386320) Innovative and stylish options - a reputation for very well thought through body and tuning options.